Del Boy and Rodney. Name a more iconic duo, I’ll wait. Okay, Del boy and Rodders might not be up there with the likes of Jay-Z and Beyoncé, but when it comes to British TV the market traders are virtual royalty. With the regeneration of the classic British sitcom Only Fools and Horses as a London musical, we’ve been pondering how effective Del was as business aficionado of Peckham. To get a handle on this, we settled down to watch all seven seasons and nine specials of the show. 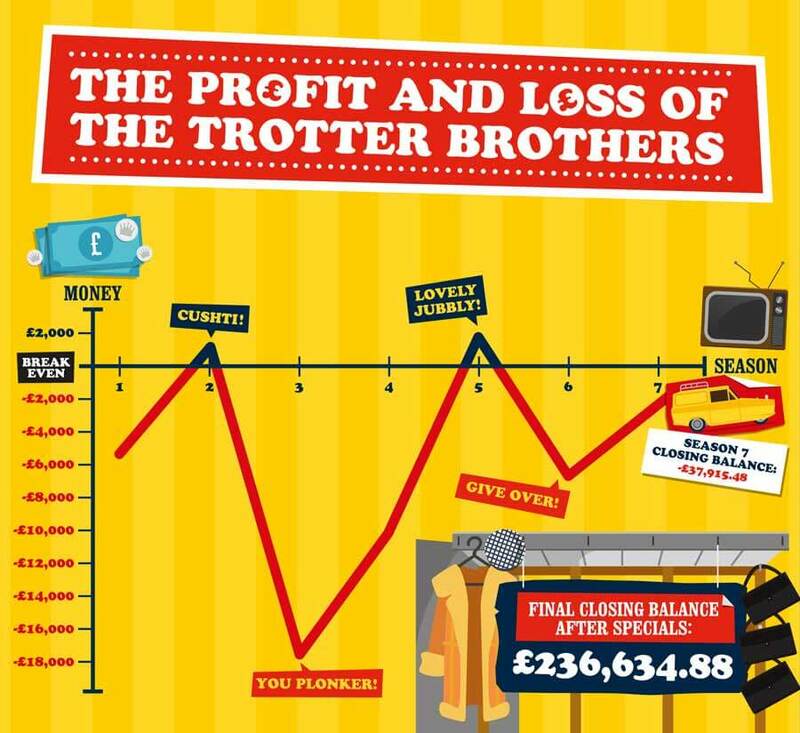 As the exploits of the Trotter brothers unfolded, we totted up their profits and losses to establish just how much success they had. And it turns out it wasn’t much. 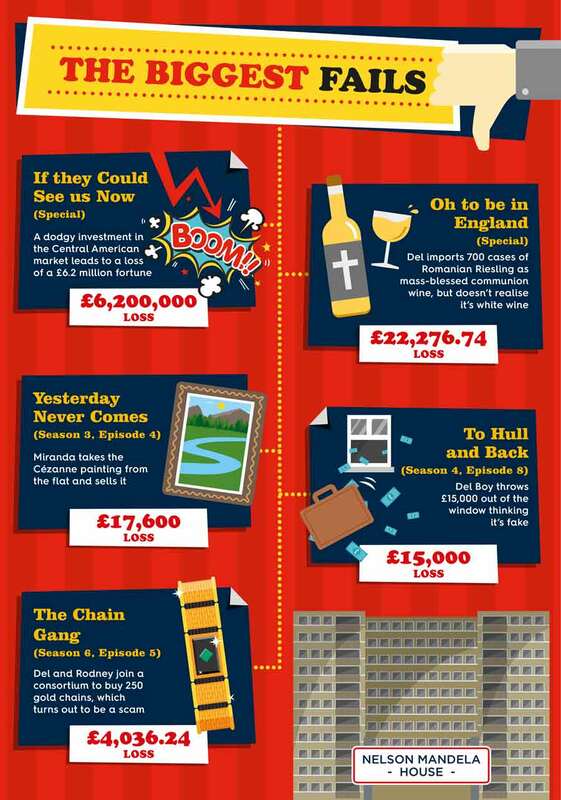 At the end of the original seven series, the state of the Trotter brothers’ business account would have been £37,915.48 in the red. It’s only due to a couple of lucky chances that Del and Rodney ended the subsequent specials with a decent profit of £236,634.88. What Can We Learn from the Trotters? Del and Rodders are great entertainment on the small screen, and now on the stage as well. But maybe there’s more than laughs that we can take away from their tales. Del Boy’s hair-brained schemes give a good few hints about what’s best to steer clear of when it comes to business planning. There are a lot of times during the series when Del and Rodney are trying to flog legit wares down Peckham market, but no one’s catching on to their deals. It’s no real surprise considering that they’re actually peddling sun cream, smack in the middle of winter! Don’t make Del’s mistake – plan your business around peaks and troughs in demand. Assess the products and services your business offers and use analytics to track periods of high or low traffic. 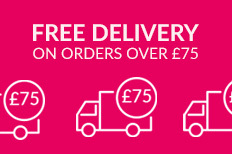 Feed this into a forward plan so you can insure you have appropriate staff, stock and marketing materials to meet the expectations of your customers. Another common predicament for the Trotters is making an impulse to buy without checking stock properly. 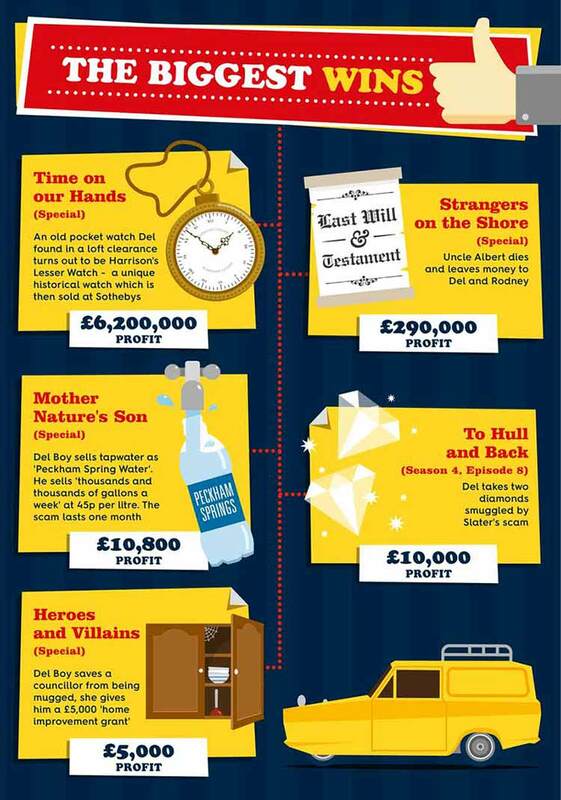 The list of Del Boy’s useless acquisitions is virtually endless. From briefcases with the lock code stuck inside, to explosive inflatable dolls, riding hats disguised as bike helmets, video recorders that only work in mainland Europe, and camcorders with Russian-standard sized tapes, a lot of Del and Rodney’s losses could have been avoided if they’d taken a bit more time to check over a business deal before jumping in head first. To avoid a similar fate, use due diligence whenever you’re looking into buying from new suppliers. Look at reviews and recommendations from previous users to find reliable companies. Read all information available about potential products so you don’t get anything unexpected. 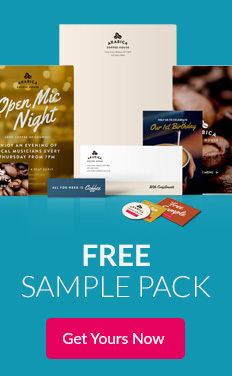 If possible, request samples of products you’re buying in bulk, so you know it’s what you’re after. It’s not just the products you’re buying that can affect your success, but the people you’re buying from too. Del and Rodney got involved with a lot of shady characters during the series. From being stung by Detective Slater’s diamond scam, to being caught out by Arnie’s scheme to trick people out of money for gold, trusting dodgy dealers resulted in a lot of trouble for the Trotters. Find out who you are working with, arrange meetings with them, research their company, and decide whether their values and objectives align with those of your business in such a way as to mean you can work together. Nowadays, you can easily find out key information about potential business associates from Google and Linked In. Throughout the series, Del’s always adamant that account keeping’s a waste of time that’ll only lead to trouble. But if it wasn’t for Rodney’s meagre attempts in the early days of their business, the brothers would never have gotten their £6.2 million windfall from the sale of Harrison’s Lesser Watch. Without the books, they wouldn’t have been able to prove legal ownership. Businesses should always ensure all transactions are properly recorded, but it’s also important to back these records up. Have external digital and physical storage of your business records in a secure location. Make sure you back these up regularly, in case you ever need to refer to them in the future. We see from Del’s interactions with Boycie, Mike and Denzel, that he has a reputation for being a bit of a conman. His customers expect a trick or a catch whenever they interact with him – not ideal for building a business! To avoid gaining a negative reputation make sure you are offering your customers high quality goods and services. If any problems arise with the products, don’t try to avoid the issue – which is Del’s go-to tact – engage with customers to try and resolve it. Learning simple lessons like these from the Trotter brothers can help keep your business on the right track and in profit, without having to rely on Antiques Roadshow-worthy attic finds.